Hello there, my name is….well, at the moment it’s Jonas de Smet though it hasn’t always been that. However, by the time you read this I’ll be dead, so my name won’t matter much at all. I’ve lived here in Amsterdam for decades, though I was born in a different country, under a different light. I came here for the light. For the art. To be close to the works of a man whose talent had touched my very soul – Vincent Van Gogh. I dare say you’re familiar with some of his paintings; pretty much everyone in the world is, so why would you be any different? Sunflowers, Irises, Starry Nights…they are images so familiar to so many, yet the man remains a mystery. Like me. This isn’t the only important letter I have sat down to write recently. I’ve given my mortality some considerable thought, as every elderly person must do, I suppose, and I’ve made some significant decisions. One of those decisions was to put matters in hand to ask my nephew, Bud Anderson – who’s a retired homicide detective with a particularly interesting new wife – to come to my home after my death and uncover my story. My true story. My full story. I’ve never met Bud, not his wife Cait Morgan, but I believe they will do as I ask, and undertake the journey I have planned for them. I understand they have much in common with each other, not the least of which is that they cannot turn their backs on a mystery that needs to be solved, nor an injustice that needs to be righted. So, yes, I believe they will travel from Canada and have an enlightening time here, in the Netherlands. I hope they enjoy art, interesting architecture, and good food and drink – because that is what they will find here, in abundance. They’ll also meet some of my oldest friends. I wonder what will be said about me, and by whom. I wish I could somehow be present to see how it all unfolds. I cannot say more – to do so would reveal too much. And I have always been a man who has taken great care to not do that. You can undertake the journey of discovery through the art-world of Amsterdam with Cait Morgan and Bud Anderson in THE CORPSE WITH THE GARNET FACE. Cathy is giving away a signed copy to any reader in the US, UK or Canada. Please comment below and include your email in this format: yourname (at) yourserver (dot) com so the spambots can't pick it up. Contest will end at midnight EST on Monday, July 25th. Sounds a little bit bittersweet yet very intriguing. Thanks for the chance to win. I Would love to undertake the journey though y our book. I like the titles in this series. Sounds like a good read. Thank you for the opportunity to win. This book looks great!!! Thanks for the chance to win!!!! Sounds intriguing! Thanks for the chance! Sounds interesting. Like that it's in another country. You have piqued my interest. I love to armchair travel via books. Thanks for the chance. I think I'd like to do some traveling with this book. Thanks for the giveaway. Interesting. Why does he think his life needs to be looked at? His death? Somehow I think it's more than a trip to the Netherlands for the art. Thanks for the chance to win. This looks really good. Jlsbookclub (at) nc (dot) rr (dot) com. I have one of your books. I would enjoy reading this book. It sounds like one I would like. This sounds really good! Thank you for the chance to win! That's a new to me series! Great review. 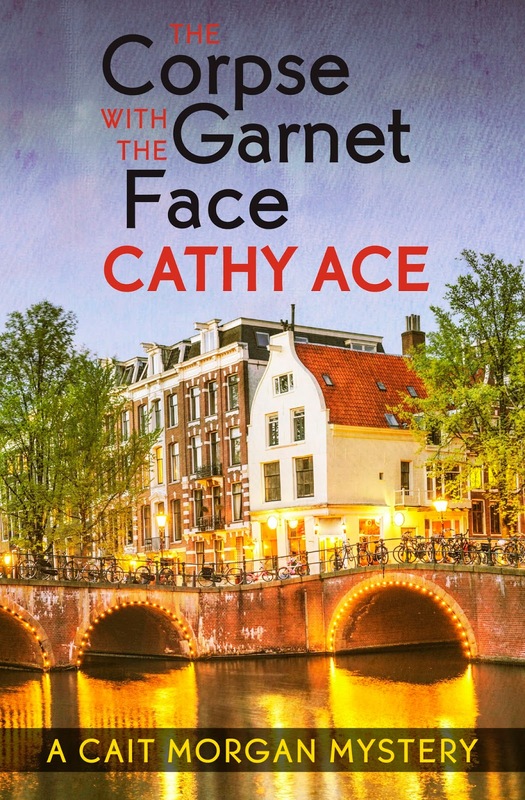 Would really enjoy reading "The Corpse With the Garnet Face". The book sounds amazing. This sounds like a terrific story. I want to find out what Bud finds out. This sounds like a great book! Can't wait to read it! This is a new series for me. Looks like I need to catch up. I be adding to my tbr list. Thanks for the chance. Hi Cathy, I'd love to add this book to my collection. So far I only own Silver, Gold and Emerald. I'd be thrilled to add Garnet (my birthstone) to the collection. I have not yet the series and am looking forward to reading. Jonas traveling to where Van Gogh lived peaks my interest as I love to visit The Met here in NYC to see the impressionist paitinings. Thanks for the opportunity!! How exciting!